BECIL Notification is out. BECIL is recruiting for 10 Content Auditor And Others Post Govt Job Posts. You can check BECIL - Broadcast Engineering Consultants India Limited last date, download BECIL notification, visit BECIL official website and check other BECIL Vacancy details.Complete Vacancy and recruitment Details about 10 Content Auditor And Others Post Govt Job vacancies in BECIL are provided below by JobSarkari.Com only for you. Last Date of Receipt Application Form. 15/04/2019. Mode of Payment. Candidate Need to Pay Fee Through Demand Draft in Favour of BROADCAST ENGINEERING CONSULTANTS INDIA LIMITED payable at New Delhi. Monitor (Print). Candidate Must Have Passed Graduation And Having 2 Years Experience in Related Field And Having Proficiency in English, Hindi and MS office. 04. Monitor (Online News Portal). Candidate Must Have Passed Graduation And Having 2 Years Experience in Related Field And Having Proficiency in English, Hindi and MS office. 04. Content Auditor. Candidate Must Have Passed PG Diploma in Journalism/ Mass Communication And 3 Years Experience in Related Field. Must be Retired As News Editor/ Dy. Director News From DD/ AIR. 02. 2. Candidate Need to Download Application Form As Given on Our Website in Important Link Section. 4. Candidate Need to Submit the Application Form on Given Address on Or Before 15th April 2019. Assistant General Manager (HR) in BECIL’s Corporate Office at BECIL Bhawan, C-56/A-17, Sector-62, Noida-201307 (U.P). Q. 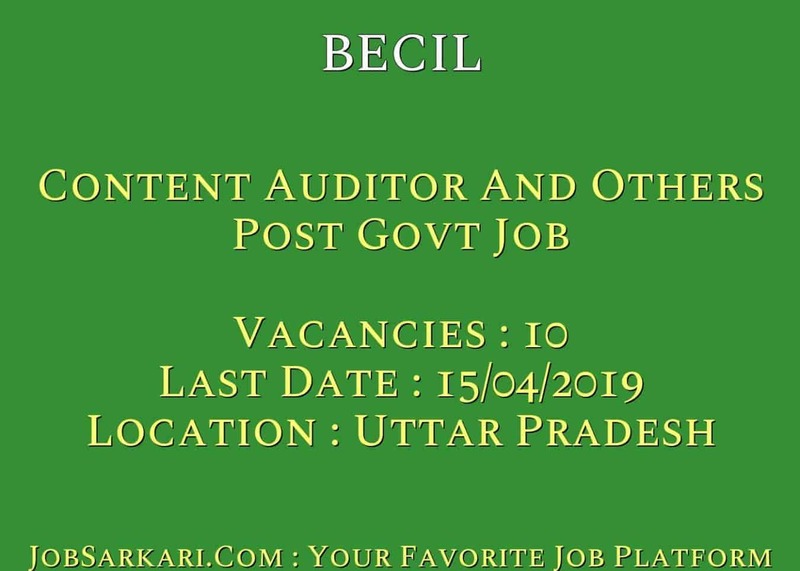 What is the Last Date For BECIL Content Auditor And Others Post Govt Job Vacancy ? A. 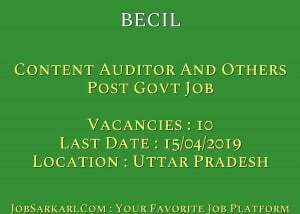 Last Date for BECIL Content Auditor And Others Post Govt Job Posts is 15/04/2019. Q. What is the Form Type of BECIL Content Auditor And Others Post Govt Job Recruitment ? A. The Form Type for BECIL Content Auditor And Others Post Govt Job Posts is Offline. Q. How many vacancies are available in Broadcast Engineering Consultants India Limited Content Auditor And Others Post Govt Job Posts ? A. There are about 10 Vacancies in Broadcast Engineering Consultants India Limited Content Auditor And Others Post Govt Job Posts. Q. What is the Full Form of BECIL ? A. Full Form of BECIL is Broadcast Engineering Consultants India Limited .